The season of Pesach (Passover), often called The Feast of Freedom, provides an opportunity for seeking out and removing any tangible and spiritual burdens we may be carrying. The Torah instructs us that every year we shall eat only unleavened bread and re-tell or re-enact the hasty departure of the Hebrew people from enslavement by Pharaoh in Egypt at Pesach time. 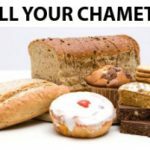 We observe this commandment by removing 'fluff', or chametz in our homes; things that have fermented or leavened beyond their simple state over the year, as a way of creating a physical memory of how to pare down to simplicity and basics. We can then become less burdened and more receptive to the greatness of simplicity, enjoy the grandeur of Nature, and each other. Let's look at two related areas of chametz for which most of us could use a good Pesach Spring Cleaning: Gossip and Privacy. First of all, what is Gossip? Is it merely idle conversation to pass the time with friends? 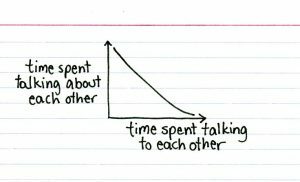 Or do we use gossip as a transaction currency? For example, currying favor by suggesting we have some 'material' about a boss at work, or about a neighbor. Some of us want to attract a circle of friends through gossip that defines who is 'in' and who is 'out'. This doesn't read as being very nice, does it? Well, research about social intelligence bears out the fact that we use gossip as a social transaction currency. Gossip can be a lucrative commodity, and we all exchange that commodity as gossip currency at times. Some of us are more strategic about this than others, but nonetheless we all do it. Judaism recognizes that we gossip and also the seriousness of harm done by gossip. 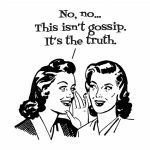 Three types of gossip are defined in our texts: Slander--LaShon HaRa, literally translates as 'the evil tongue'; Lying--Motzi Shem Ra; and Tale Bearing--Rekhilut. Slander does not involve lying, it is the damage to the person's reputation that is the harm done by sharing truth inappropriately. Slander means making a true yet derogatory statement about another person. An unjustified derogatory remark about another person, the evil tongue wagging, even though it is the truth, is forbidden. Lying about somebody, making false statements about them, is called defamation of character (Motzi Shem Ra) and the harm done is self-evident. Rekhilut (Tale Bearing) is like a peddler (Rokhel) buying from one person and selling to another. The tale peddler hears a remark, wants to profit from it, and then goes to tell the person spoken of what was said about them; this leads to harm done via the conflict and controversy that arises, with some anticipated benefit for the gossip peddler who spread the tale. What is the difference between Slander and Tale-Bearing? Slander is defined as making a derogatory but true remark about somebody, while tale-bearing means going to the person who was spoken of and reporting this fact to him, saying, "So-and-so said such-and-such about you." 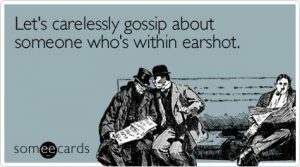 In the Jewish perspective, gossip raises a whole class of ethical and moral concerns because the root intention of gossip is to harm a reputation. In the Torah, one's reputation is their name, and if their name is tarnished or destroyed, so is that person or clan. For example, when Moses speaks to the burning bush he asks God, "What name shall I give?" He doesn't ask God "what powers or weapons should I say I have", or "what punishment shall I tell them I'll bring". 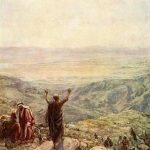 Moses asks "whose name shall I give for who sent me?" And God answers, "Yi'h'yeh asher Yi'h'yeh" I Am that I Am. God's Name=Reputation is God's Power. Although Pharaoh believed his magicians were as powerful as Moses' God, in the end God's reputation as powerful was upheld at the closing of the Sea of Reeds upon Pharaoh's army. We each have our own unique reputation and name. Next to murder, the most destructive thing we can do to someone is destroy their name. Think about this. It is said that if what you spread is true, it's gossip: if what you spread is false it is like murder. Just a little misinformation can sully forever how a person is perceived by others. Rumors or private matters spread in the public domain ruin businesses and politicians. Publicizing what is private is powerful medicine. Navigating in close quarters requires maintaining a delicate balance between being who we know we are and appearing to be what others want us to be. How goodly are your tents, O Jacob, thy dwellings, O Israel! What was it that Balaam saw that so inspired him? He saw that the entrances of their tents were not aligned with each other, ensuring that each family enjoyed a measure of privacy. And he said: If this is the case, these people are worthy of having the Divine Presence rest on them. If the damage occurs immediately, or it begins to take effect immediately and its effects gradually increase, it is considered as though he has shot his neighbor with his arrows, and the neighbor can object to his activity. This applies to damage that is caused by one's actions to the neighbor's property, e.g., his walls, pit, and various plantings on his property, as well as damage that is caused by noise or foul odors. 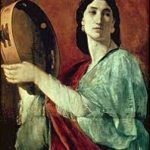 In this Blog post about cleaning out our inner and outer lives for Pesach we learn that gossip invades privacy and murders the victim's reputation; and invading a neighbor's privacy with loud music is like shooting that neighbor with arrows. Do we need to seek out gossip or can we simply go next door and ask how our neighbor is doing? do we need to have our radio or TV on mega speakers, or can we tone down our technology and enjoy the simple beauty of birdsong in our yards? *Make time to review what you own or possess. Compare that list to what you really need. Find ways to let go of the chametz; give things to charity, apologize to a neighbor. It's like cleaning the caches in your computer, which also runs better when the caches are cleaned regularly. *Watch your own courtyard and enter others' with respect. If they let you know that your radio or TV is too loud, turn it down; don't continue to 'shoot them with arrows' with your TV. You might like the sounds of nature in your yard, too. *Curiosity. This is nature's best remedy for relationships. If you are not sure who someone is, ask them. If they seem different than you, engage them with friendly questions though your genuine and natural curiosity rather than ask someone else and rely upon hearsay or gossip that may or may not be true. Feel motivated to dig in and clean? That is great! Me too. May we all grow and thrive through knowing one another.